Ancestry.com has a database titled BORDER CROSSINGS: From U.S. to Canada, 1908-1935. There are 8,589 people listing Greece as their place of birth. Remember, if you don't have a subscription to Ancestry.com, you can access it for FREE at most public libraries. This database contains records of immigrants crossing into Canada from the United States between 1908 and 1935. These records consist of border entry lists and Form 30 (individual entry forms). In April 1908, the Canadian government began recording the names of immigrants crossing into the country from the U.S. These records are the official immigration records for Canada as no other immigration records exist. 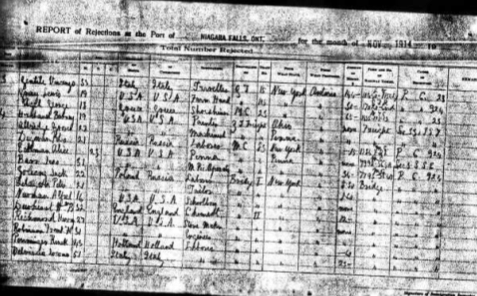 From 1908-1918, the government used border entry lists to record information about individuals coming into the country. From 1919-1924, Form 30 (individual form) was used in place of the border entry lists to record similar information. In 1925 border entry lists came into use again. Not all immigrants coming into Canada were registered. Some people may have entered the country through non-port cities or when ports were closed. Also, if at least one parent in a family was born in Canada or previously resided there, then the whole family was considered as returning citizens instead of immigrants, and were therefore not recorded. On average, the border entry lists recorded 10-20 people per page. Form 30 was an individual form and therefore was able to record more significant genealogical information about each individual. Although the use of Form 30 officially ended in 1924, there are some records of this form that date to later years. The amount of information recorded in these records varies according to form type and year. Below is a list of the type information you may find in these records. Please keep in mind that not all of this information will be available on every form. Additionally, there may be other information provided that is not listed below. Form 30 consists of two images – a front and a back side. The majority of the information is recorded on the front side, but there is also important information recorded on the back. Use the previous and next buttons in the image viewer to navigate between these images. The back side may sometimes appear before, instead of after, the front. The arrangement, or order, of the records changes depending on which form type you are looking at. The border entry lists are arranged in a general chronological order while the Form 30 records are arranged in general alphabetical order according to first letter of the surname.